In the first part of this blog post, I have told you that you don’t need to be filthy rich to travel. I’m far from rich, but luckily I can always find “travel hacks” to make my trips cheaper than they’re supposed to be. Two of them are CouchSurfing to find free bed & bathroom, and BlaBlaCar to get cheap and trusted rides from one city to another. So after following my journey from Paris to Ochsenfurt, now let’s continue the road trip! 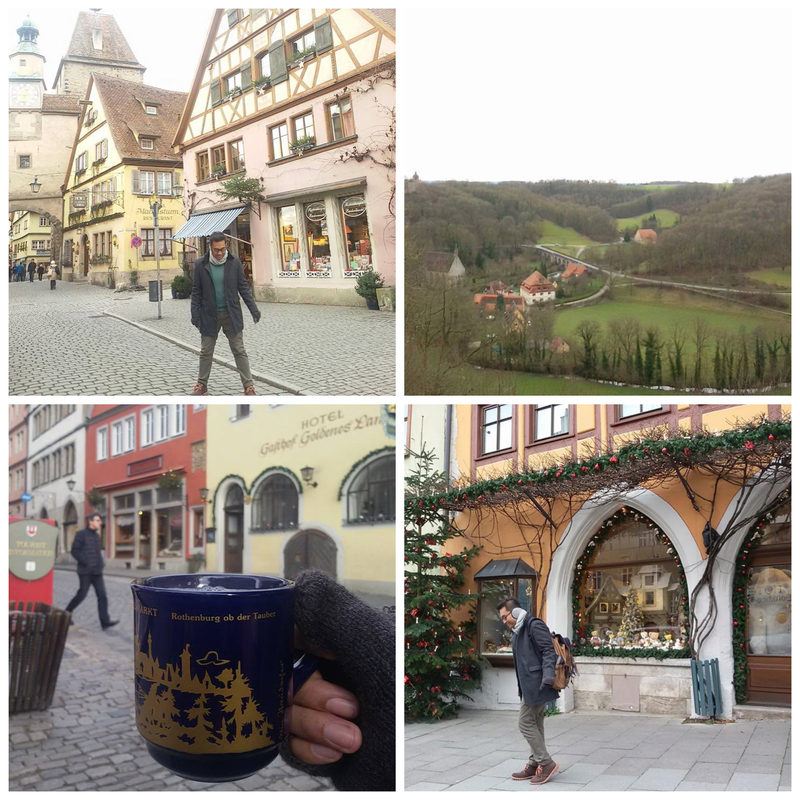 Oh man, you must see Rothenburg ob der Tauber! It’s named as world’s most charming small town by so many travel bloggers & websites. So traditional, pretty, and relaxing. This town was my main reason to visit Bavaria. I took a 50-minute train from Ochsenfurt ($5.4 one way), and voila… these pretty sights appeared in front of me. The old town area is located inside a fort. I needed 90 minutes to walk around the area. 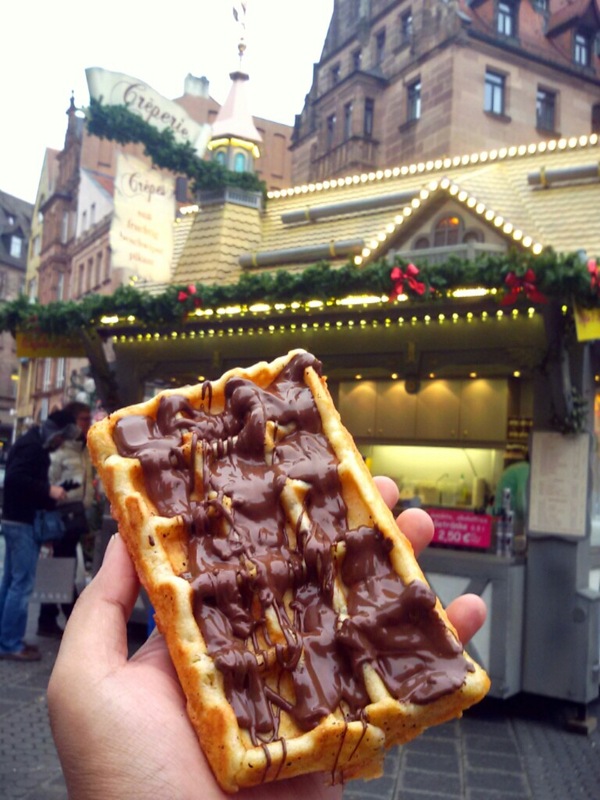 There was also a Christmas market where I tried another version of glühwein. The prettiest small town in the world! I took a train from Ochsenfurt to Nürnberg for $7.6, and a bus from Nürnberg to Prague for $15. Yes, the bus was quite expensive. But that bus ride gave me one of the most priceless travel experiences ever. I don’t need to tell a long story about this trip here. Just click the link above. There was no direct bus to Lublin from Prague, so tried to book a bus to Warsaw, the nearest city. But this time, my credit card didn’t work. I contacted Sawa, “Can you book me the bus with your card? I’ll pay it when I reach Lublin.” He said okay, but then when I arrived at his beautiful home, he refused my payment. “We’re even now,” he said. So the good karma made my trip free! I only needed to pay for my BlaBlaCar ride from Warsaw to Lublin. A car owner named Przemysław charged me $5. It was also a pleasant trip with him. He was a very friendly gentleman who had so many stories to tell. 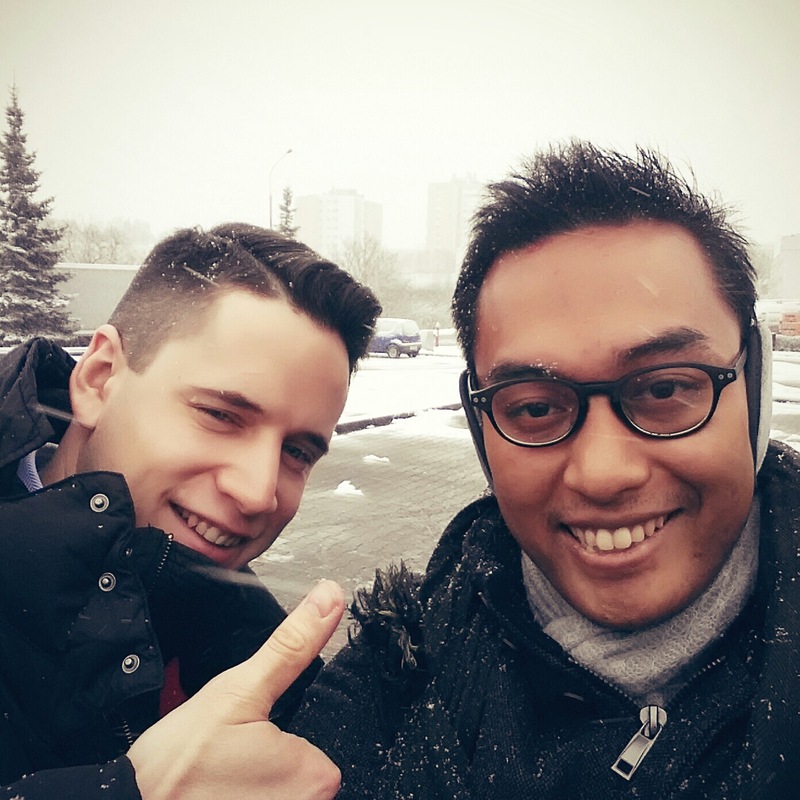 He drove from Warsaw to Lublin for a Christmas party with his fiance. Oh, you still don’t believe that BlaBlaCar is safe, do you? Take a look to the website, and you’ll see that there are rating system and reference box everyone can leave for their past drivers and riders. So you’ll know what kind of person the car owner is, if he smokes or not, brings a pet in his car or not, etc. Trust me, it’s trusted! And uhm, have I told you that it also has its own mobile apps you can easily download on your phone? 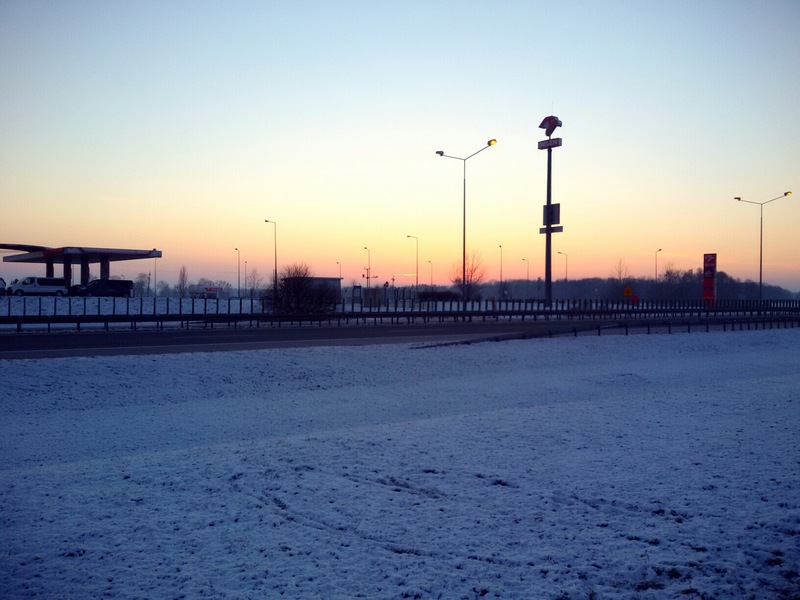 At 5:30 am in the morning, Sawa’s beautiful mother drove me to a gas station near the highway because I had an appointment with another BlaBlaCar driver that would bring me back to Warsaw after my three-day visit in Lublin. That guy, Adam, also charged me $5. But unluckily when I arrived in Warsaw, no BlaBlaCar driver available to bring me to my next destination: Berlin. So this is the perfect time to hitchhike! I waited at a gas station near the highway, bringing my classic hitchhiking board. I wrote “Take me to Berlin” there. But after 2.5 hours, I gave up and went to Marriott Hotel (near the highway) to warm myself up from the dreaded weather and find a flight or train or bus. At the lobby, a very pretty hotel guess in blue dress approached me. “Do you need help?” she asked. Maybe I looked like a frozen Asian. “Are you a hitchhiker?” she saw my board. So hell yeah, that guy came back to the hotel and drove me all the way to Germany, for free! His name was Kamil, his wife was Agnes, and they saved my life! 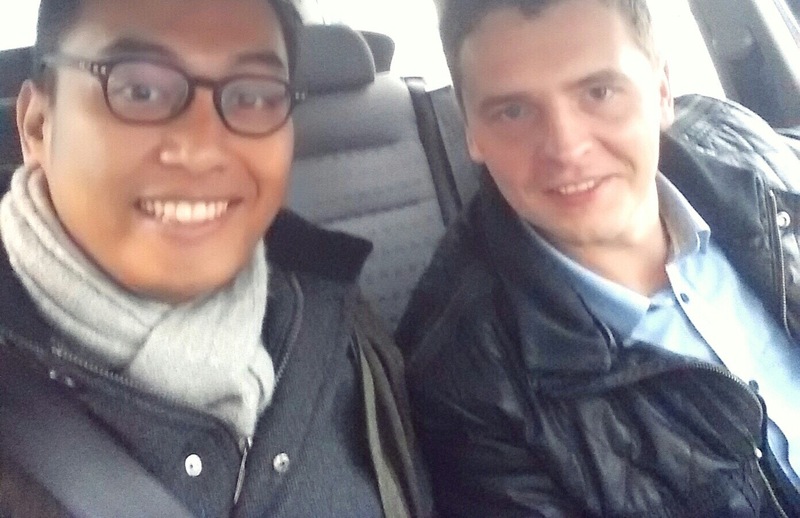 Kamil and I shared lots of stuffs on our way. He was an awesome guy. Thank God he gave me his business card, so someday I can visit this lovely couple when I come to their hometown in Kraków, Poland. I promise I will. I got a confirmation from a BlaBlaCar driver named Freeman. He was driving from Berlin to Paris, so I tagged along. He charged me quite expensive, $70. It was acceptable actually, because the ride was very long: almost 12 hours. On our ride, I learned that Freeman wasn’t actually a European, not even African-European. He was pure African, Congolese to be precise. 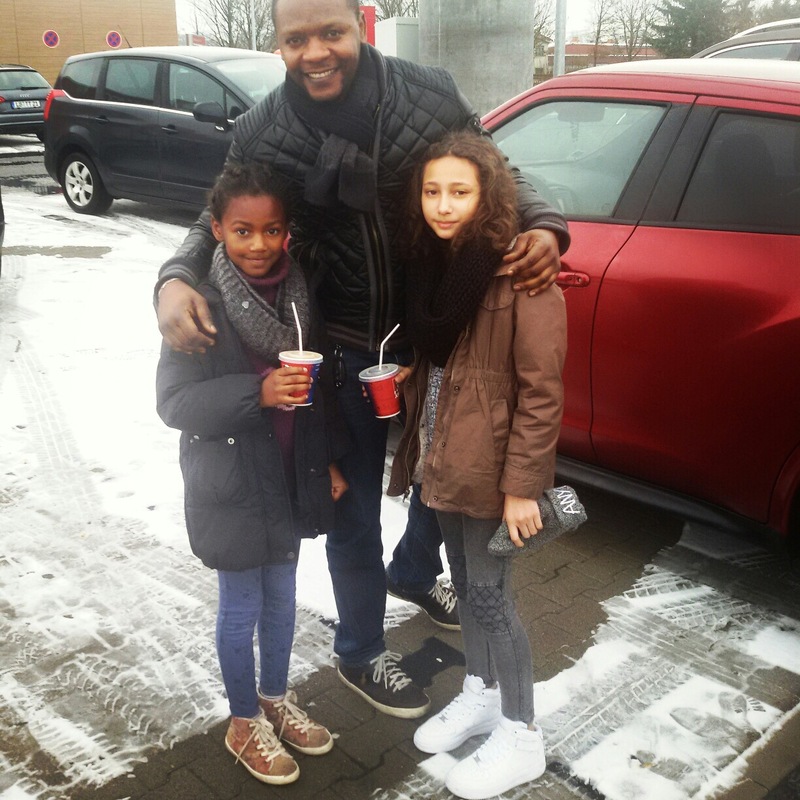 He took his two beautiful daughters, Amelié and Gdina, to travel acrross Europe for the first time. And they did it by car. “To keep their feet on the ground,” he said. They started the trip in Spain, continued to Switzerland, Italy, Czech Republic, German, and France. We shared lots of stories about our trips and some personal stories, including why one of his daughters was white. So he was married to a Belgian woman. “God is so fair. I have one white and one black. And they’re both beautiful,” he said again. Indeed, they were pretty. And very cheerful. “What?” I handed him my money. I was stunned. It was another zero dollar. So I said thank you, goodbye, and took my first walk in the city where I started this all. I can’t really believe it. Less than $100 for the 4,000 kilometers trip, more than 40 hours on the road. I have to repeat this kind of road trip one day. Join me? Hello Fikar, how are you? I hope you’re doing well. Hello Kamil. Of course I’m posting this story. Too beautiful to be missed. I’m on a non-stop travel now, and I hope I can reach Poland and go to your place. Give my kiss and hug to Agnes. Do you ever feel NOT safe? When hitchhiking? Oh I do. But the excitement always wins. Hi Fikar, good read! Keep on traveling and thanks for sharing your hitchhiking experience! I only thought it only exist in the movies.